Gotta start thinking about the weekend. It is, after all, Memorial Day, the kick off to summer time and--as usual, I am clueless about all of this. Some year, I will have this whole thing figured out, pencilled in, planned to the enth degree, and life will be beautiful. My guess is that I will have that nailed just as the people I need to plan for graduate from college. Do you think I could rent my skills to the parent of say, a first grader so they could benefit from me getting my sh*t in gear? So. The chatter at the baseball field was what to eat for Memorial Day. Our new friend Toni was extolling the deliciousness of Whoopie Pies>>which was causing my giant son to salivate and begin to beg. I know we are in trouble when they begin to beg--so I guess a double order of whoopie pies will be on the agenda for this weekend along with finishing the thesis so I can get on with my life in the world of illustration. Cornell chicken? Dreams of fresh green beans, tomatoes and summer squash? Basil by the bagful! Fresh iced tea in the sunlight with the fan blowing. On the drawing board today, specimen bags for Quest Diagnostics. Team design, team decisionmaking--the challenge is>> can it look good? We will see. The animal book is finally at press, and we should be printing mid next week! We will see chromlins tomorrow with bluelines....and away we go. Designed a cutesy envelope for them that should garner some funds just in the sheer cuteness of it. I have the Christmas card projects back that I need to focus on. It is all too much. Maybe old man Matisse will need to design some cards? What do you think? We could keep it secular with a Miami Beach palette? I need to get really caffeinated to get going on this as it is such a wringer to get a design through the process as the criteria about what means holiday shifts as the designs are circulated throughout the company. As much as I gripe about it,this is a big challenge and they always need to pick a card. It is just the process--which I wish was more intuitive--is sometimes circuitous. I was thinking about how to describe my current pictures (outside the line work) and they really have evolved to being portraits...flower portraits, bird portraits, dog portraits, ladies in burkas portraits. They are quiet and focused. They are pared down. They are studies? or are they? More to ponder. 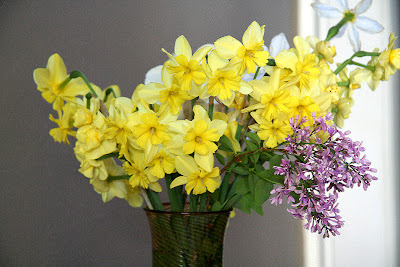 The photo is the last of the very fragrant daffodil mix and the first of the lilacs.